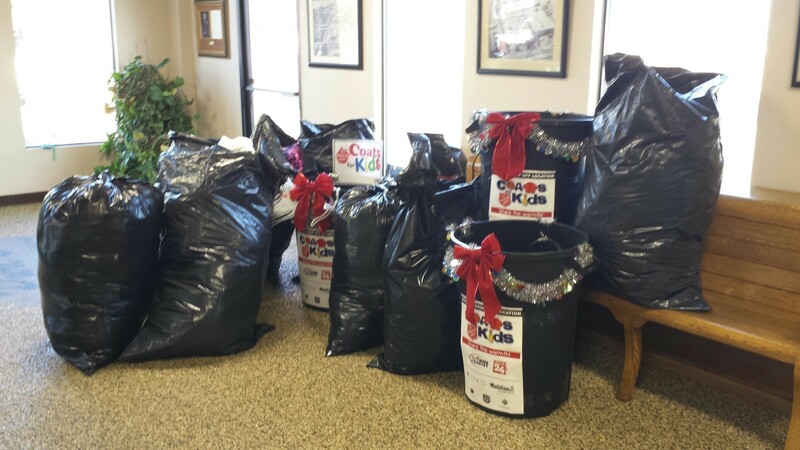 2014 Coats for Kids Drive ~ Thank You Parties! 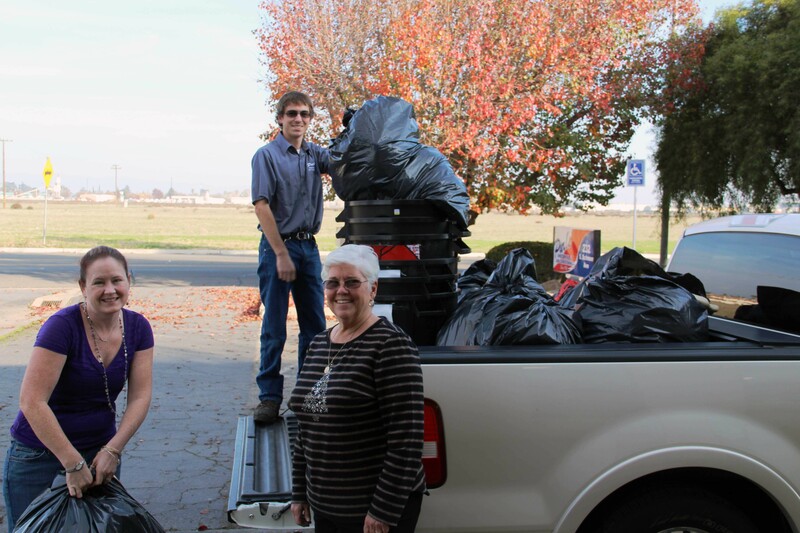 This week Purl’s Sheet Metal wrapped up our 2014 Coats for Kids drive with pizza parties at St. Joachim and Lincoln Elementary schools in Madera. 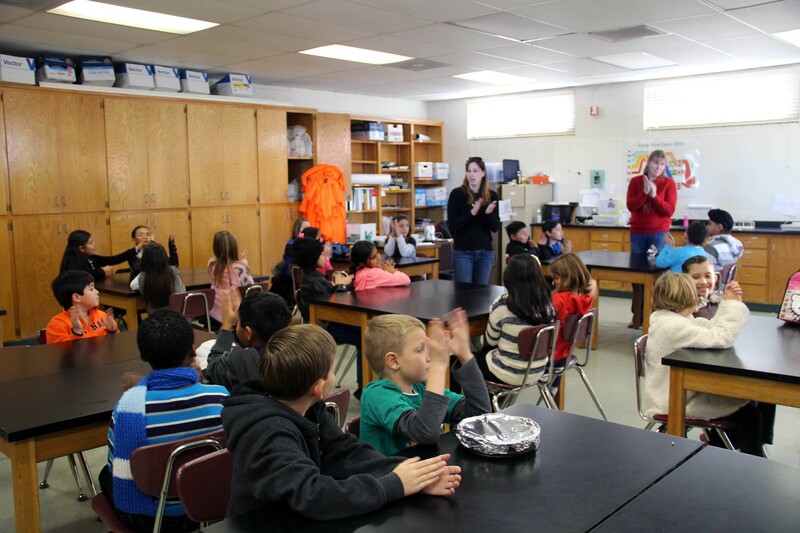 The pizza parties gave us the opportunity to celebrate with the classes who collected the most amounts of coats for The 2014 Coats for Kids drive. We had a great time at the schools and had a chance to take a class photo to send home with each of the kids. Brian Driggs and Kurt Davidson of Purl’s Sheet Metal & Air Conditioning took a moment to thank for the kids for their part in bringing in 435 coats. 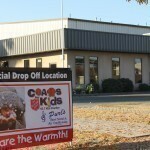 All of the coats collected stayed in Madera County and were distributed by our local Salvation Army Office. Mr. Driggs also talked about the importance of helping others in our community and how we can all make a difference. During the party he also announced that most of the coats collected had already been given to kids in need. 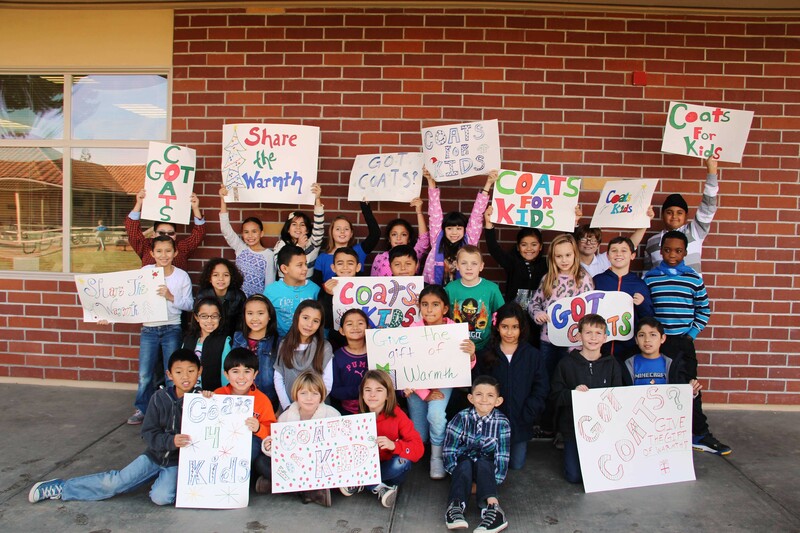 What a great way to celebrate successful Coats for Kids drive in Madera and we look forward to another great year in 2015. Posted in Community Involvement, Employee Spotlight, Happy Holidays, Uncategorized | Comments Off on 2014 Coats for Kids Drive ~ Thank You Parties! Last week Purl’s Sheet Metal & Air Conditioning wrapped up our 2013 Coats for Kids drive with pizza parties at St. Joachim and Lincoln Elementary School in Madera. 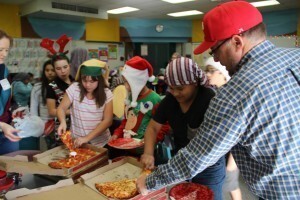 The pizza parties gave us the opportunity to celebrate with the classes who collected the most amounts of coats for the 2013 Coats for Kids drive. 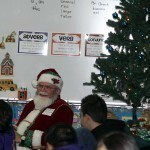 We had a great time at the schools with a surprise appearance from Santa himself. Santa brought candy canes and stayed for photos with each of the kids. Brian Driggs of Purl’s Sheet Metal & Air Conditioning took a moment to thank the kids for their part in bringing in 524 coats. All of the coats collected stayed in Madera County and were distributed by our local Salvation Army Office. 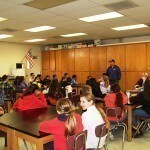 Mr. Driggs also talked about the importance of helping others in our community and how we can all make a difference. During the party he also announced that all of the coats collected had already been given to kids in need. 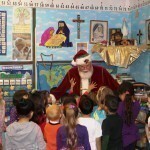 At St. Joachim School, Santa had a couple of minutes to visit the kindergarten class, who brought in the 2nd most coats. Santa thanked them for helping other kids who needed warm coats. The kindergarteners were thrilled to see Santa! 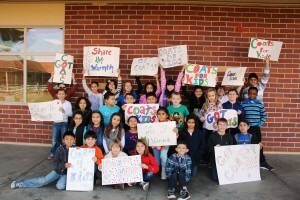 What a great way to celebrate successful Coats for Kids drive in Madera. We hope everyone had a very Merry Christmas and thank you again for all your support! Santa visiting the kind class- they had so many questions for Santa! Coats for Kids – Last Day November 30th! We have only 1 more day to accept donations for Coats for Kids 2013! 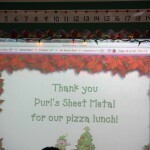 Purl’s Sheet Metal & Air Conditioning has been thrilled with the success of our partnered efforts this year. 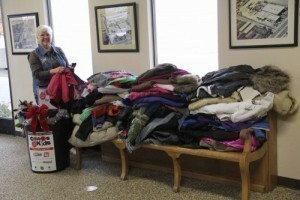 Just last week we had a total count of 229 coats. As of this Monday, our total count was up to 479 coats! That’s 250 more coats in 1 week! It has been truly amazing to witness the outpouring of community support from donations dropped off at the Purl’s Sheet Metal shop, St. Joaquim School, and Lincoln Elementary School. We are incredibly proud to be a part of this community effort. 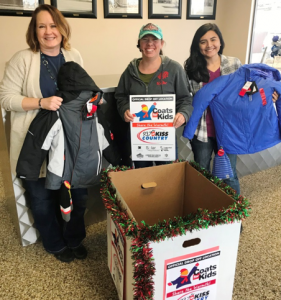 And again, THANK YOU to all who have helped contribute to this effort, whether by donating, helping count coats, load coats into trucks, bag coats, or simply spread the word – each form of contribution is what made this years Coats for Kids drive so successful. We couldn’t have done it without you! 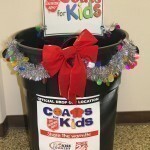 Posted in Community Involvement, Happy Holidays | Comments Off on Coats for Kids – Last Day November 30th! 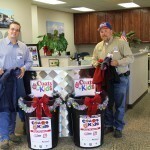 So far our Coats for Kids campaign has been a huge success! Thank you to everyone who has donated thus far. This makes such a difference in the lives of the kids in our communities. It is true that “it takes a village” to ensure the the growth and well-being of our children. 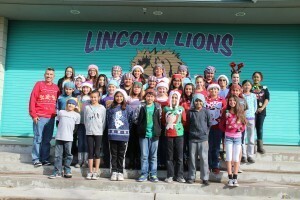 We are honored to get to be a part of this project to keep our kids warm this winter. 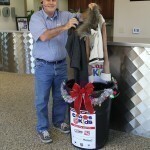 As of Thursday, November 14th, we have collected 57 coats and they keep coming in! Spread the word to friends and family! Purl’s Sheet Metal & Air Conditioning has partnered with St. Joachim School and Lincoln Elementary School in Madera as drop off centers. We are also open to the public as a drop off location for coats Monday – Friday from 8am-5pm. Come visit us! Good looking Drop Off sign for all to see! 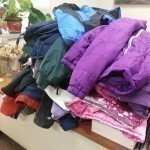 Posted in Community Involvement | Comments Off on Coats for Kids Update! ids drive. Each year the community and local businesses work with the Salvation Army to collect gently used or new winter coats to keep kids warm in the cold winter months. The Coats for Kids Campaign was established by the Salvation Army in 1980. For more than 30 years this campaign has brought together organizations, schools, businesses and members of the community with the single goal to donate to children in need. Kiss Country has been part of Coats for Kids in the Central Valley for more than 20 years. Their efforts to bring this issue and coat drive to the forefront, has made a real difference in the lives of so many young children. 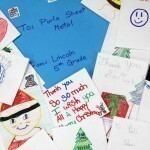 Purl’s Sheet Metal & Air Conditioning have also partnered with St. Joachim School and Lincoln Elementary School in Madera to help benefit our local kids. We are open to the public as drop off location for coats Monday – Friday from 8am-5pm. 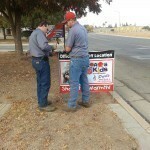 We encourage our customers and members of the community to get involved and help keep the kids in our Valley warm. Our goal is to collect hundreds of coats in the hope that no child will have to be cold!